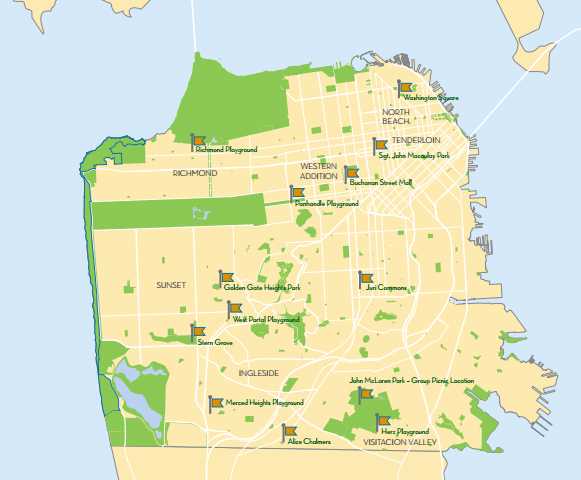 The 13 playgrounds chosen for renovation through the Let'sPlaySF! initiative were selected by a citizen task force based on presence of unhealthy chemicals in playground wood, with priority given to playgrounds in low-income neighborhoods that are dense with children. The partnership will augment $22 million for playground improvement approved by voters in the 2012 Clean & Safe Neighborhood Parks Bond with $14.5 million being raised by the Parks Alliance to ensure all 13 playgrounds can be improved in the next few years. San Francisco families and foundations have already stepped up to support private fundraising efforts, contributing millions in philanthropic funding and we invite others to join. State of Play: Download this 2015 report from the Parks Alliance on playground design trends nationwide, and the "state of play" in San Francisco. Playgrounds Task Force Report: Download the Recreation and Park Department's 2014 report on the citizen task force process that prioritized 13 playgrounds for transformation.